Despite continuing unease with global and national conditions, personal contentment remains widespread and strong. In fact, majorities in nearly all countries surveyed judge their overall life favorably. In most countries, majorities are also satisfied with their family lives, jobs and incomes. Even as many publics overwhelmingly rate their economies poorly, and rising numbers report that they are unable to afford basic necessities, the 2009 survey finds somewhat higher levels of satisfaction with personal finances generally, and with income specifically. In some cases, notably China, this rise may well reflect continued improvement in per capita incomes. In other countries, including the U.S. and Western Europe, where growth has stalled or reversed, the finding may reflect a number of factors, both objective and subjective, which are considered later in this chapter. Majorities in all but a few countries surveyed say that they are somewhat or very satisfied with their life overall. In fact, three-quarters or more in 14 of the publics polled say they are content with their lives. Indians are the most pleased; 94% note that they are satisfied with their lives, with 50% saying very satisfied. Similarly, life contentment is nearly universal in Canada (92%) and the U.S. (89%), and more than half in both countries (U.S. 54%, Canada 51%) are very satisfied. Publics of other developed nations are also content; nine-in-ten in Spain, and almost as many in France (89%), Germany (87%), Britain (86%) and Israel (85%) are happy with the state of their lives. Fewer, but still large majorities, of the Japanese (76%) and South Koreans (72%) are also pleased with how things are going for them personally. Satisfaction is not restricted to people from wealthy nations. Nearly nine-in-ten in Poland (87%), Brazil (87%), Mexico (87%), Argentina (85%) and China (85%) also have upbeat views of their lives. 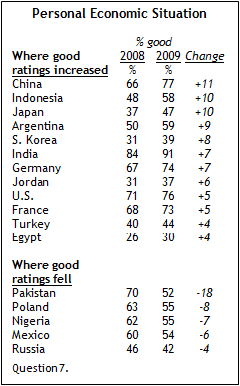 More than seven-in-ten Pakistanis (74%) and Nigerians (73%) hold the same positive view. Positive views of life overall are much less common in Egypt (41%) and Jordan (45%). In fact, discontent dominates in both publics. Majorities in Egypt (60%) and Jordan (56%) are dissatisfied with how their lives are unfolding, and many are very dissatisfied (Egypt 34%, Jordan 30%). As in past surveys, most publics are more satisfied with their family lives than with their incomes or jobs. Majorities in every country polled are satisfied with their family lives, and in 19 countries, 80% or more say they are satisfied. India and Spain rank as the most satisfied; 94% of both publics are content with their family lives. In all Western European countries polled, as well as in the U.S. and Canada, nine-in-ten or more are satisfied with their family lives. Contentment is also widespread in Argentina (91%), Brazil (90%) and Mexico (92%). There is somewhat less satisfaction with family life in Egypt (68%), Jordan (68%), Pakistan (63%) and Kenya (62%). In most countries, satisfaction with jobs among the employed trails the public’s satisfaction with family life. Still, of those who are employed, majorities in more than half of the countries surveyed are happy with their work. Americans are the most pleased; nine-in-ten in the U.S. are happy with their jobs. Positive views about work are also widespread to the north in Canada (87%). Western Europeans are largely as upbeat about their jobs. Over eight-in-ten in Spain (87%), Germany (84%), France (84%) and Britain (82%) are pleased with their work. Likewise, Latin Americans embrace their occupations; 80% of Brazilians, 78% of Mexicans and 74% of Argentines look favorably on their jobs. Views in Asia and the Middle East are more mixed. Contentment with work is very widespread in India (83%), less so in Japan (66%) and far less in Pakistan (55%). Similarly, job satisfaction is widespread in Israel (69%) but much less so in Egypt (41%). Job satisfaction is on the rise; significant increases in work contentment since 2007 are found in 18 of the countries polled. Happiness with one’s work has increased more in Poland (+20 percentage points) than any other country surveyed; 84% of working Poles are currently satisfied with their jobs while only 64% were in 2007. 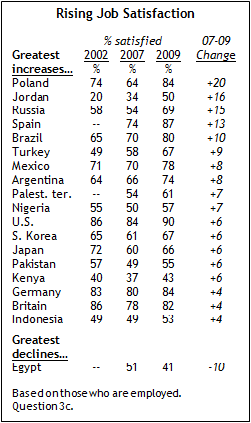 Moderate increases in job satisfaction are also evident in Jordan (+16), Russia (+15), Spain (+13) and Brazil (+10). 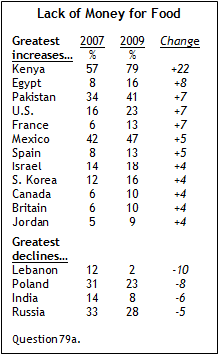 By contrast, in 2009, fewer working Egyptians (41%) are pleased with their jobs than in 2007 (51%). In nearly all of the publics fewer are satisfied with their household incomes than their family lives or jobs. Still, income satisfaction is common in many nations. Over six-in-ten in more than half of the countries surveyed say they are satisfied with their household incomes. Indians are the most satisfied; 91% note they are content with their household incomes. Income satisfaction is evident in the developed countries in the West; large percentages in Canada (80%), the U.S. (71%), Britain (70%), Spain (70%), France (66%) and Germany (66%) express satisfaction with their household income. By contrast, fewer than four-in-ten are satisfied with their income in Egypt (29%) and Jordan (34%). Notable changes in income satisfaction from 2007 have occurred in 16 countries. In 14 cases, publics are more positive now about their household incomes than in 2007. Significantly more people in China (+18 percentage points), the Palestinian territories (+16), Spain (+14), Brazil (+12), Russia (+11), Jordan (+11), Japan (+11) and Nigeria (+11) hold more favorable views of their household incomes in 2009 than in 2007. By contrast, slight declines occurred in only two countries: the U.S. (-5) and Britain (-4). Majorities in over half of the countries surveyed say that their personal economic situation is good. India tops the list with more than nine-in-ten (91%) holding a favorable view of their personal finances, and China (77%) is not far behind. Outside of India and China, developed countries dominate the list of the publics most satisfied with personal finances. Seven-in-ten or more in Canada (83%), the U.S. (76%), Britain (74%), Germany (74%), France (73%), Spain (69%) and Israel (67%) hold an upbeat view of their personal economic situation. Brazil ranks close behind; about two-thirds of Brazilians (65%) hold a positive view of their personal financial situation. Majorities in Argentina (59%), Indonesia (58%), Poland (55%), Nigeria (55%) and Mexico (54%) also offer bright assessments of their personal finances. By contrast, few in Kenya (34%), Lebanon (32%) and Egypt (30%) view their personal economic situations favorably. Between 2008 and 2009, modest increases in personal economic ratings occurred in 12 of the 21 publics for which there are trends. Several of the largest increases are seen among Asian publics; personal economic ratings increased in China (+11 percentage points), Indonesia (+10), Japan (+10), South Korea (+8) and India (+7). Positive ratings of personal finances declined substantially in Pakistan (-18 percentage points). More modest declines occurred in Poland (-8), Nigeria (-7), Mexico (-6) and Russia (-4). The overall improvement in perceptions of personal economic situations and satisfaction with household incomes may reflect several factors. First, some of the countries in which ratings are now more positive – such as China, India, and Indonesia – are still enjoying relatively robust economic growth. Second, oil prices have fallen sharply since last year and overall inflation has been minimal in most countries. This may be having a broader popular effect than unemployment which, while still rising in many nations, directly affects fewer people. Third, by May 2009, when the survey was conducted, some signs of market recovery had emerged, perhaps reducing concern among some publics about worsening impacts on their own personal situation. Moreover, widespread coverage of the impacts of the recession may tend to make those who have been relatively unaffected feel more satisfied with their personal situation. Despite generally high – and even rising – levels of reported satisfaction with personal financial situations among many publics, people in several nations report struggling to afford life’s basic necessities. Even in many developed countries in the West, significant minorities say that in the last year they have been unable to afford food, health care, or clothing. About one-quarter of Americans report lacking enough money for food (23%), health care (29%) or clothing (25%) that their family needed at some point in the last year. In France (18%) and Spain (18%), roughly one-in-five say that in the last year they have been unable to afford clothing. Kenyans appear to be suffering more than most. Nearly eight-in-ten in Kenya (79%) note they could not pay for food at some point during this past year. Similar percentages of Kenyans have lacked the money to pay for health care (74%) or clothing (70%). In Nigeria many are also living without much needed food (40%), medicine (45%) or clothes (48%). Deprivations are also widespread in Latin America.3 Half of Mexicans reveal that a lack of money has led them to go without the food (47%), medical care (50%) or clothes (51%) that they need. Nearly half of Brazilians also report that tight finances have driven them to go without health care (45%) or clothes (45%), while 36% have functioned without sufficient food. In Argentina, significant minorities say that in the last year they have managed without meeting some of their basic needs (food 26%, medical care 28%, clothes 35%) because of a lack of money. Russians and Poles are suffering as well. Roughly four-in-ten in Russia report lacking money for health care (38%) or clothes (45%), while about a quarter of Poles have experienced the same (health care 27%, clothes 23%). Deprivation levels vary considerably in Turkey and the Middle East. Roughly half of Turks report that tight finances have driven them to go without food (51%), health care (47%) or clothes (51%) in the past year. Similar basic-needs deficits are conveyed by Palestinians; in the last year many lacked the money for required medical care (50%), clothing (50%) or food (43%). Many Egyptians also note having to manage without health care (48%) or clothes (42%). In general, deprivations are less common in Lebanon and Israel; in fact, they are in line with those of the developed West. Only about one-in-five in Israel could not afford needed food (18%), health care (19%) or clothes (25%). One-in-five in Lebanon could not pay for clothes (22%) they needed, while fewer lacked the financial resources to pay for health care (14%) and food (2%). In Asia, deprivation levels are mixed. Going without basic necessities is quite common in Indonesia and Pakistan, less so in China and South Korea and uncommon in India and Japan. In the last year, between one-third and about one-half in Indonesia and Pakistan have lacked the money for food, medical care or clothes. On the opposite end of the spectrum, 10% or fewer in Japan and India report being unable to afford basic necessities. In fact, overall in Japan, fewer people report lacking the money for these three basic needs than in any other country. In 2009, significantly more people report basic needs deficits than did so in 2007. Food deprivation levels have grown in more countries than have medical care or clothing deficits. Significantly more people in 12 of 25 countries report having lacked money to pay for food in 2009 than did so when this was last measured in 2007. For some, the situation with regard to the meeting of basic food needs has grown dramatically more serious. Most notably, in 2007 57% of Kenyans lacked the financial resources to provide food they needed, while now 79% do. While food deficits are far less common in Egypt and France than in Kenya, the proportion of both publics now reporting insufficient resources to buy needed food in the past year has doubled since 2007. In Egypt, 8% reported being unable to pay for food in 2007 while 16% do now. In France, 6% experienced lacking money to pay for food in 2007 because of tight finances while 13% did this past year. This has also increased over the last two years in the U.S. (+7 percentage points) and Pakistan (+7). A similar pattern is evident with regard to health care and clothing. In eight of 25 countries the percentage of people who have experienced a lack of health care is higher than two years ago. Both Kenya (+12) and Jordan (+12) have seen double-digit increases. The percentage of people who could not afford clothing grew in nine countries between 2007 and 2009. Again, the greatest increases occurred in Kenya (+12) and Jordan (+12), and somewhat smaller increases occurred in Egypt (+11 points), the U.S. (+9) and Spain (+9). While on balance the publics surveyed are having a more difficult time paying for basic necessities than they were in 2007, there have been improvements in a few countries. In four of 25 nations, fewer people report having been unable to afford food; in three countries, fewer say they have been unable to afford health care; and in two, fewer have not been able to buy needed clothing. In particular, in both Poland and India, people are now less likely to report lacking money for all three of these necessities.